The Romanian composer George Enescu (1881–1955) is one of the neglected giants of modern music. His magnificent series of late chamber works, which starts with his Third Violin Sonata, includes pieces of striking originality, intricate beauty and expressive power which can be ranked with the finest chamber music of Ravel, Janácek or Bartók. Outside Romania, however, most of Enescu’s music is unknown, and the only pieces played at all frequently in the concert hall are his two early and far from typical Romanian Rhapsodies. Judging Enescu by those pieces alone is rather like judging Ravel on the basis of Bolero and nothing else. There are several obvious reasons for this neglect. One is the sheer multifariousness of Enescu’s gifts, which meant that he was best known in America as a conductor, and in Europe as a violinist. Even in his own lifetime, therefore, his other talents helped to obscure and overshadow his vocation as a composer. Another reason for neglect was his peculiar homelessness as a national composer: although deeply attached to Romanian music, he was also a product of both the French and the Germanic traditions. He pursued his career as a performer mainly outside Romania, and his final years were spent in self-imposed exile from Communism. Never part of a movement or group of composers, he charted a very solitary compositional course. After his death, he was promoted (albeit with grotesque inefficiency) by the Communist regime in Romania as a national, folkloristic composer: this had the effect of narrowing his reputation, in European terms, still further. Only now can we in the West begin to discover the true range and richness of Enescu’s creative legacy. Enescu was born to a fairly prosperous middle- or lower-middle-class family in the north-eastern corner of Romania, close to the Ukrainian border. He showed a precocious talent for both violin-playing and composition, and at the age of seven he entered the Vienna Conservatoire. There he encountered Brahms, and developed what was to be a life-long devotion to his music. In 1895 Enescu moved to the Paris Conservatoire, where his teachers included Massenet and Fauré, and his friends and fellow-students included Ravel and Alfred Cortot. Even before he left the Conservatoire in 1899, he had attracted public acclaim in Romania as a composer; up until the first world war, he was based mainly in Paris, but spent several months each year in his native land, where he was appointed court musician to the Romanian royal family. Major works of this period included his first symphony (1905); his second and third symphonies were completed in Romania during the war. Enescu spent the Second World War, like the First, in his native land. His musical life was necessarily constrained by wartime conditions, but the highlights of these years included a series of concerts and recordings in Bucharest with his godson, Dinu Lipatti. Also during these years Enescu wrote some of his finest chamber works, including the Impressions d’enfance for violin and piano, the Piano Quintet and the Second Piano Quartet. In 1946, as the stranglehold of the Communist Party over Romania was inexorably tightened, Enescu went into exile. During his final years he lived in circumstances of increasing poverty in Paris. Suffering from a chronic disease (a crippling curvature of the spine), he was unable to keep up his career as a violinist or conductor and spent more of his time as a teacher (notably at the music summer-schools at Bryanston, where he was a formative influence on the young Amadeus Quartet). He continued to compose, producing two more chamber works, the Second String Quartet (1951/2) and the Chamber Symphony (1954). Enescu suffered a paralysing stroke in the summer of 1954, and died on the night of 3/4 May 1955. Enescu was still at the Paris Conservatoire when he wrote his Second Violin Sonata in April 1899. Listening to it, one would hardly guess that it was a student work, though one could not fail to notice the influence of Gabriel Fauré, who had taught Enescu composition. Certainly this work represents a huge stylistic advance on Enescu’s First Violin Sonata (1897), which was written in a much more foursquare classical style dominated by Schumann, Brahms and Saint-Saëns. From Fauré, evidently, Enescu had acquired devices of musical suppleness, complexity and elegant understatement: a sense of linear fluidity, sonorous but delicate keyboard textures, and an elliptical harmonic language combining modal progressions with hints of chromatic voluptuousness. This sonata was dedicated to the young French violinist, and fellow student at the Conservatoire, Jacques Thibaud (and to his pianist brother, Joseph). Enescu was entranced by the passionate delicacy of Thibaud’s style as a violinist and evidently tried to capture something of that elusive musical quality in the writing of this work. Interviewed late in his life, Enescu described the genesis of this sonata as follows: ‘At the age of fourteen, when I was walking by myself in Prince Maurouzi’s garden, a theme came into my head. I carried it inside me for three years; then, at the age of seventeen, I wrote my Second Violin Sonata in the space of a fortnight.’ The work does have an extraordinary unity, mainly because of the way in which it is pervaded by the long, mysterious, harmonically suggestive and rhythmically disorientating theme which opens the first movement. Elements of this theme are developed throughout the work, in ways which not only vary the rhythmical pattern but also compress or expand the intervals between the notes, until one is left with a sense of a powerful but indeterminate musical shape behind the theme itself. Two of Enescu’s most enduring characteristics as a composer can be noticed in this work. One is his development of an ‘organicist’ structure in which everything is related to everything else. Enescu had a deep-rooted preference for cyclical form, especially for that version of cyclical form which not only re-states the themes of earlier movements in the finale, but also piles them one on top of another, using the device of cumulative superimposition to reveal their hidden affinities. The other characteristic is his love of harmonically ambiguous modes which shift from major to minor: this technique derives ultimately from the chromatic modes of Romanian folk music, with their ‘mobile’ major-minor thirds, and it is put to use with touching simplicity in the slow movement of this sonata. The Third Violin Sonata is in some ways a very untypical piece. No other mature work by Enescu has such a consistently, explicitly and exotically folk-Romanian character. By the time he wrote this sonata in 1926, Enescu had written other works with a Romanian flavour to them: some of the dances in Act I of Œdipe, for example, or the mysterious last movement of the First Piano Sonata (1924), which he once described as a depiction of a moonlit Romanian landscape. But he had come to feel that the direct quotation of folk tunes (as in his early Romanian Rhapsodies) was a fruitless procedure. There was nothing he could do with such tunes, he said, other than state them, juxtapose them and repeat them: any attempt to subject them to proper musical development would destroy their nature. In his increasingly organicist style, musical development and the exploration of complex inter-relationships was the very essence of composition. However, there were some techniques of Romanian folk music which seemed to offer new compositional possibilities, ways of enriching his own methods of musical development. One such technique has already been mentioned: the use of chromatic modes to break down the distinction between major and minor keys. Another technique was the use of quarter-tones, eroding the tonal scale itself. And a third, perhaps the most important of all, was the use of ‘heterophony’—that is, the superimposition of differing versions of the same musical material, sometimes with a slight time-lag as well, but without creating any sense of counterpoint, canon or fugue. In his attempt to capture the spirit of Romanian folk music, Enescu developed for this sonata what is virtually a new language of violin writing. The music is full of extremely detailed instructions such as ‘flautato sulla tastiera colla punta del arco’ (‘flute-like, with the point of the bow, on the fingerboard’); the ornamentation is elaborately notated, and different degrees of vibrato are also specified. When this is combined with the frequent fluctations of rhythm, tempo, dynamic and mood, the result is a score brimming with expressivity. Menuhin has written: ‘I know of no other work more painstakingly edited or planned. It is correct to say that it is quite sufficient to follow the score for one to interpret the work’. When Enescu has done with this extraordinary degree of specification is, paradoxical though this sounds, to convey a spirit of improvisation. 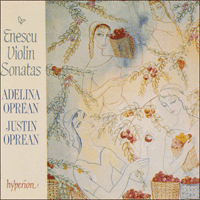 Much of the violin technique used here is, of course, an imitation of the playing of Romanian folk-fiddlers—though the term ‘imitation’ here covers a whole spectrum, from the direct reproduction of techniques (such as using a slight upwards portamento to lean into the beginning of a note) to the much more elusive evocation of mood and spirit. The piano part is imitative too: most obviously, of cymbalom-playing, though there are other sorts of imitative effect as well. The strange repeated notes at the start of the slow movement were, according to one pianist who played this work with Enescu (Céliny Chailley-Richez) an imitation of the squeaking of toads on a summer evening. Alfred Cortot, who also discussed and played this work with the composer, described the slow movement as ‘an evocation in sound of the mysterious feeling of summer nights in Romania: below, the silent, endless, deserted plain; above, constellations leading off into infinity …’. But whether the listener thinks of toads or galaxies is secondary. The music is primary. Enescu’s practice as a composer suggests that he was torn by conflicting impulses. Sometimes an entire work would come to him, like the Second Violin Sonata, in a single flow; huge sections of Œdipe were sketched out with staggering speed, (Act 3, for example, was drafted in a single 24-hour spurt). But he was also a perfectionist who would keep chiselling away at his works with painstaking slowness, even with ones which had been performed and published, for years on end. Some large orchestral pieces were abandoned altogether; others were put on one side, leaving his musical executors after his death unable to tell whether some of the manuscripts they found were to be regarded as finished works or not. The definitely abandoned works include a dramatic cantata, a fourth and a fifth symphony, and a large orchestral work called Les Voix de la nature (‘The Voices of Nature’). Most poignantly of all, Enescu’s Second Piano Sonata was composed but never written down: up till the end of his life he insisted that it was ready, entire, in his mind—‘elle est là dans ma tête’. Of all periods in Enescu’s life, the years 1909 to 1913 seem to have been the worst afflicted with self-doubt. A piano quintet was abandoned in 1909; nothing at all was written in 1910; an orchestral work titled Suite châtelaine was half-written and then put aside in 1911; and a piano sonata, which was begun in 1912, seems to have disappeared completely. Various biographical reasons can be found for this sorry state of affairs: illnesses, disappointments—his Symphonie concertante for cello and orchestra was loudly booed at its premiere in 1909—and, above all, the death of his mother in March of that year. But reasons internal to his stylistic development as a composer are important too, as the Sonata Torso helps to demonstrate. The only completed movement of this sonata (recorded here for the first time) was written out in a fair copy by Enescu and dated 5 October 1911. Fair-copying and dating were special marks of approval for Enescu; and yet the manuscript of the second movement breaks off after one page, and nothing more of this work survives. Given that Enescu never gave the sonata an opus number, never performed it and never even referred to it, we can be certain that it was consciously abandoned, rather than merely mislaid. And it is the stylistic qualities of the work that suggest the reason why. In some ways, this tantalising piece of music shows the direction in which Enescu’s style was advancing during this period. Rhythmical fluidity is one of the essential elements here: in the piano part there are elaborate cross-rhythms, and in the violin line there are frequent shifts between dotted rhythms, triplets, and other more complex subdivisions of the beat. The linear fluency of the writing is so pronounced that it tends towards a kind of seamlessness, which begins to rob the melody of its melodic function. (A similar criticism can be made of the Symphonie concertante.) It is difficult to tell which phrases are transitional joining-up passages, and which are the melodic statements proper. The distinction between the two is not a necessary one, of course, and it is one of the characteristic features of many of Enescu’s later works that it disappears almost entirely (the first movements of the Piano Quintet and the Third Violin Sonata are good examples of this). But in order for that to happen, a more fluid and rarefied harmonic language was needed too. In this ‘Sonata Torso’, the underlying harmonic scheme seems unable to cope with the melodic and rhythmical subtleties of the score. This problem first arises in the opening four bars, where a delicately suggestive and exploratory violin line is tied as if by its ankle to an immediately familiar sequence of bar-by-bar harmonic changes. Elsewhere the harmonies lean too closely towards some of the predictabilities of late-romantic salon music in a way that belies the rhythmical and textural originality of the writing. Not for nothing has the great Romanian composer and critic Pascal Bentoiu described this as ‘one of the most stylistically impure works Enescu ever wrote’. And yet, as Bentoiu also points out, there are passages of wonderful felicity in the delicate interplay of the instrumentation, and the final pages are exceptionally well paced and balanced. Lying as it does almost exactly half-way between the Second and Third Violin Sonatas, this work helps us to see the distinctive excellences of those sonatas in a new and even clearer light. Le compositeur roumain Georges Enesco (1881–1955) est l’un des géants méconnus de la musique moderne. Sa magnifique série d’œuvres de chambre tardives, commençant par sa Troisième Sonate pour Violon, comprennent des morceaux d’une originalité remarquable, d’une complexe beauté et d’une grande puissance expressive, qui peuvent se mesurer avec la meilleure musique de chambre de Ravel, Janácek ou Bartók. Mais en dehors de la Roumanie, la musique d’Enesco est presqu’inconnue et les seuls morceaux qu’on joue fréquemment en concert sont ses deux Rhapsodies Roumaines, œuvres de jeunesse qui sont loin d’être typiques. Juger Enesco en se basant sur ces deux morceaux, c’est un peu comme si on jugeait Ravel en se basant uniquement sur le Boléro. Il y a plusieurs raisons évidentes pour cet oubli. D’abord la grande diversité des dons d’Enesco, qui lui ont valu d’être connu en Amérique surtout comme chef d’orchestre, et en Europe surtout comme violoniste. Même de son vivant, ses autres talents contribuaient donc à mettre dans l’ombre sa vocation de compositeur. Une autre raison était son caractère de compositeur national dépaysé: bien que profondment attaché à la musique roumaine, il avait aussi des racines dans les traditions françaises et germaniques. Il poursuivit sa carrière d’exécutant surtout en dehors de la Roumanie et ses dernières années se passèrent en exil volontaire du communisme. Il n’appartint jamais à un mouvement ni à un groupe de compositeurs et travailla en solitaire. Après sa mort, le régime communiste roumain lui décerna (avec une incompétence grotesque) le titre de compositeur national folklorique: cela eut pour résultat de diminuer encore davantage sa réputation en Europe. Ce n’est que maintenant qu’on peut, en Europe de l’ouest, découvrir la véritable tendue et la richesse de l’héritage d’Enesco en tant que compositeur. Enesco était né dans une famille aise de la classe moyenne, à l’extrémité nord-ouest de la Roumanie, près de la frontière avec l’Ukraine. Il fit preuve d’un talent précoce pour le violon et la composition et à l’âge de sept ans, fut admis au Conservatoire de Vienne. Il y fit connaissance de Brahms et y cultiva un amour de la musique qui devait durer toute sa vie. En 1895, il alla étudier au Conservatoire de Paris où il eut comme professeurs Massenet et Fauré et comme camarades Ravel et Alfred Cortot. Avant même de sortir du Conservatoire en 1895, il était appréci du public roumain comme compositeur; jusqu’à la première guerre mondiale, il vécut surtout à Paris, mais passait plusieurs mois par an dans son pays natal où il fut nommé musicien de cour de la famille royale de Roumanie. Sa première symphonie est l’une des grandes œuvres qu’il composa à cette époque (1905); il termina ses deuxième et troisième symphonies en Roumanie pendant la guerre. Enesco passa la seconde guerre mondiale, comme la première, dans son pays natal. Ses activités musicales furent nécessairement entravées par la guerre, mais parmi les évènements marquants de ces années, il y eut une série de concerts et d’enregistrements à Bucarest avec son filleul, Dinu Lupati. C’est aussi à cette époque qu’Enesco composa ses plus belles œuvres de musique de chambre, dont les Impressions d’Enfance pour violon et piano, le Quintette avec piano et le Deuxième Quatuor avec piano. En 1946, alors que l’emprise du Parti Communiste sur la Roumanie s’intensifiait inexorablement, Enesco partit en exil. Pendant ses dernières années, il vécut dans une misère croissante à Paris: souffrant d’une maladie chronique (une grave scoliose), il était incapable de poursuivre sa carrière de violoniste ou de chef d’orchestre et consacrait davantage de son temps à l’enseignement (notamment aux universités d’été de Bryanston où il contribua à la formation des jeunes membres du Quatuor Amadeus). Il continuait à composer et acheva deux autres œuvres de musique de chambre, le Deuxième Quatuor à Cordes (1951/52) et la Symphonie de Chambre (1954). Enesco fut paralysé par une attaque d’apoplexie, pendant l’été de 1954, et mourut dans la nuit du 3 au 4 mai 1955. Enesco était encore élève du Conservatoire de Paris lorsqu’il composa sa Deuxième Sonate pour violon en avril 1899. En l’écoutant, on ne se douterait pas qu’il s’agit d’une œuvre d’étudiant, mais on remarque forcément l’influence de Gabriel Fauré, qui lui avait enseigné la composition. Cette œuvre représente certainement un grand progrès de style par rapport à la première Sonate pour violon d’Enesco (1897), écrite dans un style beaucoup plus carrément classique, dominé par Schumann, Brahms et Saint-Saëns. Il avait appris de Fauré des techniques de souplesse musicale, de complexité et d’élégante réserve: une fluidité linéaire, des textures de clavier sonores mais délicates et un langage harmonique elliptique associant des progressions modales avec des chromatismes voluptueux. Cette sonate était dédiée à son camarade au Conservatoire, le jeune violoniste Jacques Thibaud (et à son frère pianiste, Joseph); Enesco était charmé par la délicatesse passionnée du style violonistique de Thibaud et avait évidemment essayé de capter cette qualité musicale insaisissable. Dans un interview vers la fin de sa vie, Enesco décrivait ainsi la genèse de cette sonate: «A l’âge de quatorze ans, alors que je me promenais seul dans le jardin du Prince Maurouzi, il me vint un thème à l’esprit; et puis, à l’âge de dix-sept ans, je composai ma Deuxième Sonate pour Violon en une quinzaine de jours». L’œuvre présente en effet une unité extraordinaire, principalement à cause du long thème mystérieux du début du premier mouvement, suggestif par son harmonie et déconcertant par son rythme, qui envahit la sonate. Des éléments de ce thème sont développés dans toute l’œuvre, de façon non seulement à varier le rythme, mais aussi à réduire ou augmenter les intervalles entre les notes, donnant à l’auditeur l’impression d’une forme musicale puissante, mais indéterminée derrière ce theme même. On remarque dans cette œuvre deux des caractéristiques les plus durables d’Enesco en tant que compositeur. L’une est le développement d’une structure «organiciste» dans laquelle chaque élément est apparenté aux autres. Enesco avait une préférence profonde pour la forme cyclique, et en particulier pour cette version de la forme cyclique qui ne se contente pas de répéter les thèmes des mouvements précédents dans le finale, mais les superpose les uns aux autres, révélant ainsi leurs affinités cachées. La seconde caractéristique est sa prédilection pour des modes harmoniques ambigués qui passent du majeur au mineur: cette pratique est dérivée des modes chromatiques de la musique folklorique roumaine, avec leurs tierces majeures-mineures «mobiles» et elle est utilisée avec une simplicité touchante dans le mouvement lent de cette sonate. La Troisième Sonate pour violon n’est pas un morceau typique. Aucune des autres œuvres de la maturité d’Enesco ne présente un caractère folklorique roumain de façon aussi explicite, exotique et persistante. Lorsqu’il composa cette sonate, en 1926, Enesco avait écrit d’autres œuvres avec une atmosphère roumaine: plusieurs des danses de l’Acte I d’Œdipe, par exemple, ou le dernier mouvement mystérieux de la première sonate pour piano (1924), dont il avait dit un jour que c’était la description d’un paysage de Roumanie au clair de lune. Mais il estimait maintenant que la citation directe de mélodies folkloriques (comme dans ses Rhapsodies Roumaines, œuvre de jeunesse) était un procédé stérile. On ne pouvait faire de ces mélodies, disait-il, rien d’autre que les citer, les juxtaposer et les répéter: toute tentative de les soumettre à un développement musical classique en détruirait la nature. Son style devenait de plus en plus «organiciste»: le développement musical et l’exploration de rapports intérieurs complexes était l’essence même de sa composition. Mais il y avait des techniques de la musique folklorique roumaine qui semblaient présenter de nouvelles possibilités de composition, des moyens d’enrichir ses propres méthodes de développement musical. Nous avons déjà mentionné une de ces techniques: l’emploi de modes chromatiques pour atténuer la distinction entre majeur et mineur. Une autre technique est l’utilisation de quarts de ton, mettant en question la gamme même. Une troisième technique—sans doute la plus importante—est l’utilisation de «l’hétérophonie»—c’est à dire la superposition de versions différentes du même matériel musical, parfois avec un léger retard temporel, mais sans véritablement donner l’impression de contrepoint, de canon ou de fugue. Je n’utilise pas le mot «style» parce qu’il implique quelque chose de fabriqué ou d’artificiel, tandis que «caractère» implique quelque chose de donné, qui existe dès le début […] De cette façon, les compositeurs roumains pourront écrire des compositions valables, dont le caractère sera semblable à celui de la musique folklorique, mais obtenu par des moyens différents, absolument personnels. En essayant de capter l’esprit de la musique folklorique roumaine, Enesco a mis au point pour cette sonate un langage virtuellement nouveau d’écriture violonistique. La musique est remplie d’instructions extrêmement détaillées comme «flautato sulla tastiera colla punta del arco» («flûte, avec la pointe de l’archet, sur la touche»); l’ornementation est minitieusement notée et les différents degrés de vibrato sont spécifiés. Lorsque tout cela est combiné avec de fréquentes fluctuations de rythme, de tempo, de dynamique et d’atmosphère, il en résulte une partition qui déborde d’expression. Menuhin a écrit: «Je ne connais aucune autre œuvre qui soit éditée ou préparée avec autant de soin. Il est exact de dire qu’il suffit de suivre la partition pour interpréter l’œuvre.» Mais paradoxalement, si Enesco a fourni toutes ces indications précises, c’est pour donner l’impression d’une improvisation. La technique de violon qu’il utilise est évidemment en grande partie une imitation du jeu des violoneux du folklore roumain—bien que le terme «imitation» couvre ici tout un éventail, allant de la reproduction directe de techniques (comme l’utilisation d’un léger portamento vers le haut pour appuyer sur l’attaque d’une note) à l’évocation beaucoup plus fugitive d’un esprit et d’une atmosphère. La partie de piano est aussi imitative: elle reproduit évidemment le cymbalum, mais il y a aussi d’autres imitations. Les étranges notes répétées au début du mouvement lent sont, selon un pianiste qui accompagna Enesco (Célini Chailley-Richez), une imitation du cri des crapauds par un soir d’été. Alfred Cortot, qui joua aussi avec le compositeur et parla de l’œuvre avec lui, a décrit le mouvement lent comme «une vocation sonore de la sensation mystérieuse des nuits d’été en Roumanie: en bas, la plaine sans fin, déserte et silencieuse; au dessus, des constellations qui vont vers l’infini …» Mais que l’auditeur pense à des crapauds ou à des constellations, c’est une considération secondaire. L’essentiel, c’est la musique. De toutes les périodes de la vie d’Enesco, c’est pendant les années 1909 à 1913 qu’il douta le plus de lui-même. En 1909 il abandonna un quintette avec piano; en 1910, il ne composa rien du tout; en 1911 il composa à demi, puis mit de côté une œuvre orchestrale intitulée Suite châtelaine; et une sonate pour piano qu’il commença en 1912 a, semble-t-il, complètement disparu. Il y a diverses raisons biographiques pour ce triste état de choses: des maladies, des déceptions—sa Symphonie concertante pour violoncelle et orchestre fut violemment huée lors de la première audition en 1909—et surtout la mort de sa mère en mars de cette année-là. Mais il y a aussi d’importantes raisons inhérentes à son développement stylistique de compositeur, comme le Torse de Sonate le prouve. Le seul mouvement complet de cette sonate (enregistré ici pour la première fois) est recopié au propre de sa main et daté 5 octobre 1911. Copier au propre et dater étaient les marques d’approbation définitives d’Enesco; mais cependant le manuscrit du second mouvement s’interrompt après une page et rien de plus de cette sonate n’a survécu. Etant donné qu’Enesco n’a jamais donné de numéro d’opus à cette sonate, ne l’a jamais joue ni même mentionnée, on peut être sûr qu’elle ne fut pas simplement égarée, mais délibérément abandonnée. Et les qualités stylistiques de l’œuvre en suggèrent la raison. A certains points de vue, ce morceau intrigant montre la direction dans laquelle le style d’Enesco progressait pendant cette période. La fluidité rythmique en est l’un des éléments essentiels: dans la partie de piano, il y a des contre-rythmes compliqués et dans la mélodie du violon de fréquents changements entre rythmes pointés, triolets et autres subdivisions encore plus complexes de la mesure. La fluidité de la ligne est tellement prononcée qu’elle tend à une espèce de continuité ôtant presque toute fonction mélodique à la mélodie. (On pourrait adresser la même critique à la Symphonie concertante.) Il est difficile de savoir quelles phrases représentent des passages de transition et quelles phrases sont la mélodie proprement dite. La distinction entre les deux n’est pas essentielle, bien sûr, et l’une des caractéristiques de beaucoup des œuvres plus tardives d’Enesco, c’est que cette distinction disparaît presque complètement (les premiers mouvements du Quintette avec piano et de la Troisième Sonate pour violon en sont de bons exemples). Mais pour en arriver là, il fallait aussi mettre au point un langage harmonique plus fluide et plus austère. Dans son «Torse de Sonate», le système harmonique sous-jacent semble incapable d’accommoder les subtilités mélodiques et rythmiques de la partition. Le problème se présente pour la première fois dans les quatre mesures d’ouverture, où une mélodie de violon délicatement suggestive et exploratrice est comme attachée par la cheville à une séquence immédiatement familière de transformations harmoniques, mesure par mesure. Ailleurs, les harmonies se rapprochent de certains lieux communs de la musique de salon de la fin du romantisme, d’une façon qui est en désaccord avec l’originalité de rythmes et de texture de l’écriture. Ce n’est pas pour rien que le grand compositeur et critique roumain Pascal Bentoiu a qualifié cette œuvre de «l’une des plus stylistiquement impures qu’Enesco ait jamais composées». Et pourtant, comme Bentoiu le fait aussi remarquer, on y trouve des passages très heureux, dans les changes délicats des deux instruments, et les dernières pages du mouvement sont exceptionnellement bien mesurées et équilibres. Située presqu’exactement à mi-chemin entre les Deuxième et Troisième sonates, cette œuvre nous aide à voir les réussites particulières de ces sonates sous un jour nouveau encore plus clair. Der rumänische komponist George Enescu (1881–1955) ist einer der vernachlässigsten Großen auf dem Gebiet der modernen Musik. Seine hervorragenden kammermusikalischen Spätwerke, angefangen bei seiner dritten Violinsonate, enthalten Passagen von eindrucksvoller Originalität, verstrickter Schönheit und starker Ausdruckskraft, die sich mit der großartigsten Kammermusik Ravels, Janácveks oder Bartóks messen kann. Der größte Teil von Enescus Musik ist jedoch außerhalb Rumäniens weitgehend unbekannt geblieben, die einzigen Musikstücke, die ihren Weg häufiger in die Konzertsäle gefunden haben, sind seine beiden frühen und nicht sehr typischen „Rumänischen Rhapsodien“. Enescu allein nach diesen beiden Stücken zu beurteilen, hieße, Ravel nur nach seinem Bolero und nichts anderem zu beurteilen! Für diese Vernachlässigung Enescus gibt es mehrere eindeutige Gründe, wovon einer die reine Mannigfaltigkeit seiner Gaben ist. So war er in Amerika am besten als Dirigent bekannt und in Europa als Geigenvirtuose. Selbst zu seinen Lebzeiten trugen seine anderen Talente ihr Teil dazu bei, seine Berufung als Komponist zu verdecken und zu überschatten. Ein weiterer Grund dieser Vernachlässigung war seine eigentümliche Heimatlosigkeit als ein nationaler Komponist: zwar tief mit der rumänischen Musik verwurzelt, war er jedoch ebenfalls ein Produkt der französischen und deutschen Traditionen. Seine Karriere als Virtuose verfolgte er hauptsächlich außerhalb Rumäniens, seine letzten Jahre verbrachte er in freiwilligem Exil vom Kommunismus. Er gehörte zu keiner Zeit einer Bewegung oder Gruppe unter den Komponisten an, sondern beging einen sehr einsamen kompositorischen Weg. Nach seinem Tod wurde er von der kommunistischen Regierung (mit grotesker Ineffizienz) zum nationalen Volkskomponisten erklärt: dies hatte zur Folge, daß sein Ruf sich auf europäischer Ebene noch weiter verringerte. Erst heutzutage fangen wir im Westen an, die wahre Vielfältigkeit und den Reichtum von Enescus schöpferischem Nachlaß zu entdecken. Enescu entstammte einer recht wohlhabenden bürgerlichen Familie im Nordosten Rumäniens an der ukrainischen Grenze. Schon früh zeigte er eine Begabung für Geigenspiel und Komposition, so daß er im Alter von sieben Jahren in das Wiener Konservatorium eintrat. Dort traf er auf Brahms, zu dem er eine lebenslange Verehrung seiner Musik hegte. 1895 ging Enescu ans Pariser Konservatorium, wo Massenet und Fauré zu seinen Lehrern und Ravel und Alfred Cortot zu seinen Freunden und Mitschülern gehörten. Noch bevor er das Konservatorium im Jahre 1899 verließ, fand er in Rumänien öffentliche Anerkennung als Komponist; bis zum Ausbruch des ersten Weltkriegs war Paris sein Hauptwohnsitz, er verbrachte aber auch mehrere Monate im Jahr in seinem Geburtsland Rumänien, wo er zum Hofmusiker der rumänischen Königsfamilie ernannt wurde. Zu den größeren Werken dieser Periode gehören u.a. seine 1. Sinfonie (1905); seine 2. und 3. Sinfonie entstanden während des Krieges in Rumänien. Seit 1910 arbeitete Enescu außerdem zeitweise an seiner Oper Œdipus. Ein vollständiger Entwurf für Klavier wurde 1922 beendet; sein Leben in den zwanziger Jahren wurde von der Orchestrierung dieser Oper beherrscht, davon, diesen Entwurf in die ungeheuer komplexe Dirigierpartitur umzugestalten. Diese Aufgabe hatte er 1931 beendet, und die Uraufführung fand 1936 an der Pariser Oper statt. Die Jahre zwischen den beiden Weltkriegen sahen Enescu die Höhe seines Ruhmes als Virtuose in Europa und Amerika erklimmen. Auch als Lehrer war er sehr gefragt, er nahm jedoch selten Schler auf regelmäßiger Basis an, mit der besonderen Ausnahme von Yehudi Menuhin, der bei ihm 1927 zu studieren begann. (Später kamen u.a. noch Arthur Grumiaux, Ida Haendel, Ivry Gitlis und Christian Ferras hinzu). Enescu verbrachte den zweiten Weltkrieg dort, wo er auch den ersten verbracht hatte: in seinem Geburtsland. Sein Musikleben war notgedrungen durch die Kriegsbedingungen eingeschränkt, es gab in diesen Jahren aber einige Höhepunkte, zu denen eine Reihe von Konzerten und Schallplattenaufnahmen mit seinem Patensohn Dinu Lipatti in Bukarest gehörten. Während dieser Jahre schrieb Enescu außerdem einige seiner besten Kammermusiken, darunter Impressions d’enfance für Violine und Klavier, das Klavierquintett und das zweite Klavierquartett. Als 1946 der Würgegriff der kommunistischen Partei immer fester wurde, begab Enescu sich ins Exil. Seine letzten Jahre verbrachte er in immer größerer Armut in Paris: er litt an einer chronischen Krankheit (einer lähmenden Rückgratverkrümmung), die eine Fortführung seiner Karriere als Virtuose und Dirigent zusehends unmöglich machte, so daß er mehr und mehr Zeit mit Unterrichten verbrachte (besonders in den Musiksommerschulen in Bryanston, wo er einen formenden Einfluß auf das junge Amadeus-Quartett ausübte). Er komponierte weiterhin und produzierte zwei neue Kammermusiken, das zweite Streichquartett (1951/52) und die Kammersinfonie (1954). Im Sommer 1954 erlitt Enescu einen schweren Schlaganfall. Er starb in der Nacht vom 3. zum 4. Mai 1955. Enescu befand sich noch am Pariser Konservatorium, als er im April 1899 seine zweite Violinsonate schuf. Der Zuhörer kommt hierbei kaum auf den Gedanken, daß sie das Werk eines Musikschülers ist, obwohl der Einfluß seines Kompositionslehrers Gabriel Fauré schlecht zu übersehen ist. Dieses Werk zeigt aber im Vergleich zu seiner ersten Violinsonate (1897) einen großen stilistischen Schritt nach vorn, denn sie ist in einem viel unverblümteren, von Schumann, Brahms und Saint-Saëns beherrschten, klassischen Stil geschrieben. Von Fauré hatte Enescu offensichtlich musikalische Geschmeidigkeit, Komplexität und elegantes „Understatement“ übernommen: ein Gefühl für lineare Flüssigkeit, für klangvolle, aber auch feinfühlige Klaviaturstrukturen und für eine elliptische harmonische Sprache, die modale Fortschreitung mit einem Anflug von chromatischer Üppigkeit verbindet. Die Sonate war dem jungen französischen Geiger und Mitschüler am Konservatorium, Jacques Thibaud (und seinem Bruder, dem Pianisten Joseph Thibaud) gewidmet; Enescu war von der leidenschaftlichen Feinfühligkeit des Spiels Thibauds verzaubert und versuchte offenbar etwas von dieser flüchtigen musikalischen Qualität in seinen eigenen Werken einzufangen. In einem Interview gegen Ende seines Lebens beschrieb Enescu die Entstehung seiner Sonate in den folgenden Worten: „Als ich im Alter von vierzehn Jahren allein im Garten des Prinzen Maurouzi spazierenging, kam mir ein Thema in den Sinn. Ich trug es drei Jahre lang mit mir herum und schrieb dann, als ich siebzehn war, meine zweite Violinsonate innerhalb von vierzehn Tagen“. Das Werk besitzt eine außergewöhnliche Geschlossenheit, vorwiegend durch die Art und Weise, in der es von dem langen, geheimnisvollen, harmonisch suggestiven und rhythmisch verwirrenden Thema durchdrungen wird, das den ersten Satz einleitet. Elemente dieses Themas werden auf eine Weise die ganze Sonate hindurch entwickelt, die nicht nur das rhythmische Schema variieren, sondern auch die Intervalle zwischen den Noten verdichten oder ausdehnen, bis man mit dem Gefühl einer ausdrucksvollen, aber unbestimmten musikalischen Gestaltungsform hinter dem Thema selbst zurückgelassen wird. Zwei der dauerhaftesten Merkmale in Enescus Rolle als Komponist sind an diesem Werk auffallend. Davon ist zunächst das eine, daß er eine ganzheitliche Struktur entwickelt, in der sich alles auf alles andere bezieht. Enescu besitzt eine tiefverwurzelte Vorliebe für die zyklische Form, besonders für die, die nicht nur die Themen früherer Sätze im Finale wieder aufgreift, sondern diese auch eins auf das andere häuft, indem er sie kumulierend übereinanderschichtet, um dann mit diesem Kunstgriff ihre verborgenen Affinitäten zutage zu fördern. Das andere Merkmal ist seine Liebe zu harmonisch zweideutigen Tonarten, die sich von Dur zu Moll verschieben: diese Technik stammt letztlich von den chromatischen Modi rumänischer Volksmusik mit ihren „mobilen“ Dur-Moll-Terzen. Dieses wird mit rührender Einfachheit im langsamen Satz dieser Sonate genutzt. In mancher Hinsicht ist die dritte Violinsonate ein sehr untypisches Musikstück. Kein anderes, gereiftes Werk Enescus hat einen derartig beständigen, deutlichen und exotischen rumänischen Folklore-Charakter. Zu dem Zeitpunkt, an dem Enescu 1926 diese Sonate schuf, hatte er bereits andere rumänisch getünchte Werke komponiert: einige der Tänze im ersten Akt von Œdipus, zum Beispiel, oder den mysteriösen letzten Satz der ersten Klaviersonate (1924), die er als Darstellung einer mondbeschienenen rumänischen Landschaft beschrieb. Er war aber zu dem Ergebnis gekommen, daß unmittelbare Zitate von Volksweisen (wie in seinen „Rumänischen Rhapsodien“) ein fruchtloses Unterfangen waren. Es gäbe nichts, was er mit diesen Weisen tun könne, sagte er, außer sie zu konstatieren, aneinanderzureihen und zu wiederholen; alle Ansätze, sie einer richtigen musikalischen Durchführung zu unterwerfen, würden ihr Wesen vernichten. In seinem zunehmend ganzheitlichen Stil wurden Themenverarbeitung und Untersuchung komplizierter Wechselbeziehungen zum wahren Wesen der Komposition. Es gab jedoch einige Techniken in der rumänischen Volksmusik, die neue kompositorische Möglichkeiten und Wege zur Bereicherung seiner eigenen Methoden musikalischer Verarbeitung zu bieten schienen. Eine solche Technik wurde bereits erwähnt: die Verwendung chromatischer Modi, um den Unterschied zwischen Dur- und Molltonarten zu verwischen. Eine andere Technik ist die Verwendung von Viertelnoten, um damit das tonale Ambiente zu untergraben. Eine dritte und vielleicht die wichtigste Technik ist die Verwendung von „Heterophonie“—d.h. die Übereinanderstellung verschiedener Versionen des gleichen musikalischen Materials, manchmal sogar mit einer leichten Zeitverschiebung, aber ohne ein kontrapunktisches, kanonisches oder fugisches Gefühl aufkommen zu lassen. Ich benutze das Wort „Stil“ nicht, daß es etwas Hergestelltes oder Künstliches bezeichnet, während das Wort „Charakter“ auf etwas von vornherein Gegebenes, Existierendes hinweist. […] Auf diese Art können rumänische Komponisten wertvolle Musik schaffen, die der Volksmusik zwar gleicht, die jedoch mit völlig anderen, eigenen Mitteln erzielt wird. In seinem Versuch, den Geist der rumänischen Folklore einzufangen, entwickelte Enescu für diese Sonate effektiv eine neue Sprache in der Violinkomposition. Die Musik ist voller äußerst detaillierter Anweisungen, wie z.B. „flautato sulla tastiera colla punta del arco“ („flötenartig, mit der Spitze des Bogens auf dem Griffbrett“); die Ornamentik ist ausführlich notiert, verschiedene Grade von Vibrato sind ebenfalls angegeben. Wird das mit den häufigen Schwankungen des Rhythmus’, Tempos, der Dynamik und Stimmung verbunden, ist das Ergebnis eine Partitur, die von Ausdruckskraft nur so überfließt. Menuhin schrieb dazu: „Ich kenne kein anderes Werk, das so gewissenhaft ediert und geplant wurde. Es wäre korrekt zu sagen, daß man nur der Partitur zu folgen braucht, um das Werk zu interpretieren“. Nachdem Enescu mit diesem Übermaß an Spezifikationen zu Ende gekommen ist, wird paradoxerweise ein Gefühl von Improvisation vermittelt. Ein Großteil der hier angewandten Violintechnik ist natürlich eine Imitation des Spiels der rumänischen Volksgeiger—obwohl der Begriff „Imitation“ hier ein ganzes Spektrum umfaßt, von der der direkten Reproduktion von Techniken (wie z.B. ein leichtes Aufwärts-Portamento, das sich in den Beginn einer Note lehnt) bis zur viel flüchtigeren Evokation von Stimmung und Geist. Auch der Klavierpart ist imitativ: am offenkundigsten als Cimbalklänge, aber es gibt noch vielerart andere Nachahmungseffekte. Die fremdartigen, wiederholten Noten zu Beginn des langsamen Satzes waren nach Ansicht eines Pianisten (Céliny Chailly-Richez), der das Werk zusammen mit Enescu spielte, eine Nachahmung quakender Kröten an einem Sommerabend. Alfred Cortot, der dieses Werk ebenfalls mit dem Komponisten diskutiert und gespielt hat, beschrieb den langsamen Satz als „eine Klang-Evokation des Mysteriösen der Sommernächte in Rumänien: unten die schweigenden, endlosen, verlassenen Ebenen; oben, Sternbilder, die ins Unendliche führen …“ Ob nun der Hörer an Kröten oder Milchstraßen denkt, ist nebensächlich, Hauptsache ist die Musik. Enescus Arbeitsweise als Komponist läßt vermuten, daß er sich in einem Zwiespalt widersprüchlicher Impulse befand. Manchmal wurde er von einer ganzen Schöpfung, wie z.B. der zweiten Violinsonate, auf einmal durchströmt; riesige Abschnitte von Œdipus wurden mit atemberaubender Geschwindigkeit skizziert. (Akt III wurde beispielsweise innerhalb von 24 Stunden entworfen). Er war jedoch auch ein Perfektionist, der noch jahrelang mit gewissenhafter Langsamkeit an seinen Werken herumfeilte, selbst an denen, die bereits veröffentlicht und aufgeführt worden waren. Einige größere Orchesterstücke wurden ganz und gar wieder verworfen; andere wurden beiseite gelegt, bis sie nach seinem Tod von seinen Nachlaßverwaltern gefunden wurden, die sich nun fragten, ob manche der gefundenen Manuskripte fertiggestellte Schöpfungen waren oder nicht. Unter den wirklich abgebrochenen Werken befinden sich eine dramatische Kantate, eine 4. und 5. Sinfonie und ein großes Orchesterwerk mit dem Titel Les Voix de la Nature („Die Stimmen der Natur“). Am bedauerlichsten ist, daß Enescus zweite Sonate für Klavier zwar komponiert, aber niemals niedergeschrieben worden ist: bis zu seinem Lebensende bestand er darauf, daß er sie komplett im Kopf hatte—„elle est là dans ma tête“. Von allen Perioden in Enescus Leben schienen die Jahre von 1909-1913 am meisten von Selbstzweifeln zerrüttet gewesen zu sein. Ein Klavierkonzert gab er 1909 auf; 1910 schrieb er überhaupt nichts; ein Orchesterwerk mit dem Titel Suite châtelaine wurde 1911 zur Hälfte geschrieben und dann beiseite gelegt; eine Klaviersonate, die er 1912 angefangen hatte, scheint völlig verloren gegangen zu sein. Es können für diesen traurigen Zustand jedoch verschiedene biographische Gründe gefunden werden: Krankheiten, Enttäuschungen—seine Symphonie concertante für Cello und Orchester wurde bei der Premiere mit lauten Buhrufen begrüßt—und vor allem der Tod seiner Mutter im März dieses Jahres. Aber auch Gründe, die seiner stilistischen Entwicklung als Komponist inneliegen, sind wesentlich, wie die Sonata Torso veranschaulicht. Der einzige beendete Satz dieser Sonate (hier zum erstenmal aufgenommen) wurde von Enescu in Reinschrift niedergeschrieben und mit dem 5. Oktober 1911 datiert. Das Anfertigen von Reinschriften und ihre Datierung bedeuteten für Enescu das spezielle Siegel seiner Zustimmung: und trotzdem wird das Manuskript des zweiten Satzes nach einer Seite abgebrochen, und von diesem Werk ist nichts überliefert worden. Wenn man davon ausgeht, daß Enescu der Sonate niemals eine Opusnummer gegeben, sie nie aufgeführt und niemals darauf Bezug genommen hat, muß er sie bewußt fallengelassen haben, statt sie nur versehentlich verlegt zu haben. Es sind die stilistischen Eigenschaften dieses Werkes, die den Grund dafür nahelegen. In mancher Hinsicht zeigt dieses verlockende Musikstück die Richtung an, in die sich Enescus Stil während dieser Periode bewegte. Rhythmische Flüssigkeit ist hier eines der wesentlichsten Elemente: im Klavierpart gibt es kunstvolle Gegenrhythmen, und die Violinstimme wechselt häufig zwischen punktierten Rhythmen, Triolen und anderen, komplizierteren Aufteilungen des Taktes. Die lineare Flüssigkeit der Satzweise is so prominent, daß sie sich auf eine Art Nahtlosigkeit beläuft, die die Melodie ihrer melodischen Funktionen zu berauben beginnt. (Eine ähnliche Kritik kann der Symphonie concertante gegenüber gemacht werden). Es läßt sich nicht leicht sagen, welche Phrasen Überleitungen und welche die eigentlichen melodischen Aussagen sind. Es ist natürlich nicht unbedingt notwendig, dazwischen einen Unterschied zu finden, und es ist charakteristisch für viele von Enescus späteren Werken, daß diese Unterscheidung fast völlig verschwindet (die ersten Sätze des Klavierquintetts und der dritten Violinsonate sind dafür gute Beispiele). Um dies jedoch geschehen zu lassen, war eine flüssigere und exklusivere Harmoniesprache vonnöten. In dieser „Sonata Torso“ scheint das unterschwellige harmonische Schema nicht mit den melodischen und rhythmischen Feinheiten der Partitur klarzukommen. Dieses Problem erhebt sich zuerst in den vier Einleitungstakten, in denen eine zart suggestive und explorative Violinstimme von einer unmittelbar vertrauten Folge von taktweisen Harmonieänderungen umklammert wird. Anderswo lehnen sich die Harmonien zu sehr an manche der so leicht vorauszusehenden Harmonien der spätromantischen Salonmusik an, und zwar auf eine Weise, die die rhythmische und strukturelle Originalität der Satztechnik verleugnet. Nicht umsonst hat der große rumänische Komponist und Kritiker Pascal Bentoiu dieses als „eines der am stilistisch unreinsten Werke“ Enescus beschrieben. Und trotzdem, wie Bentoiu ebenfalls hervorhebt, gibt es in dem feinfühligen Zusammenspiel der Instrumente Passagen von wunderbarer Formulierungskunst. Die letzten Seiten dieses Satzes sind besonders gut ausgewogen. Diese Schöpfung, die zeitlich fast genau zwischen die zweite und dritte Violinsonate fällt, trägt dazu bei, daß wir die ausgezeichnete Qualität dieser Sonaten in einem neueren und klareren Licht sehen.